Every day, goods are shipped all around the planet in boxes. With the explosion of online shopping and world trade, the demand for corrugated boxes has been rising exponentially. 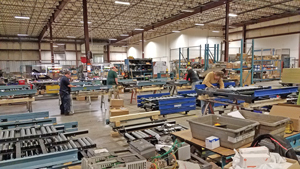 That’s good news for Lynchburg-based Automated Conveyor Systems (ACS), which builds the equipment and systems needed to make corrugated boxes of every size. 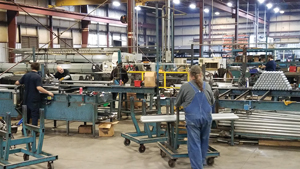 That good fortune also extends to about 200 companies in the Central Virginia region that support the conveyor industry, such as steel and cylinder manufacturers. 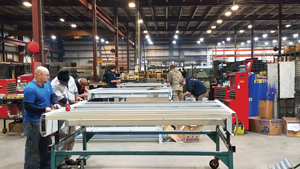 “This area is one of the hotspots in the world for the conveyor business,” said Les Womack, vice president of engineering for Sentry Equipment & Erectors in Forest. That history can be traced to Bob Englander of woodstove fame, who started Simplimatic in 1965. Spinoffs from Simplimatic took root, as did other related companies. Womack said the major players in the conveyor systems industry today include Sentry Equipment, ACS, BW Packaging and Alliance Industrial. All these companies have survived by staying nimble. 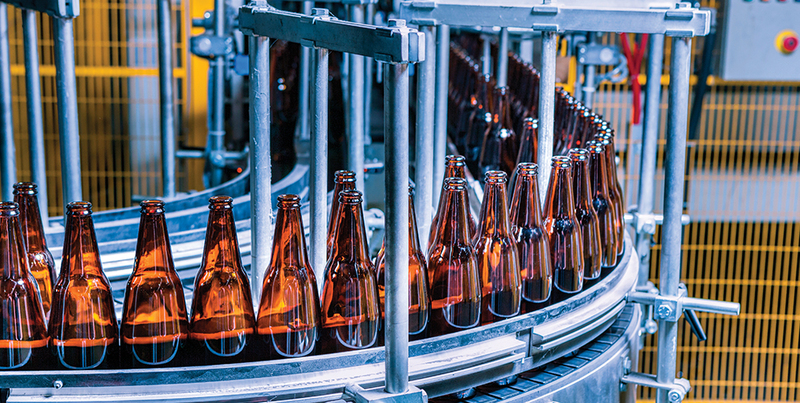 Sentry Equipment, for example, has diversified from almost exclusively bottling beverages like Coca-Cola and Dr. Pepper to working with food, pharmaceuticals, gasoline, and even shingles. “We like the fact that our region is so strong in automated conveyor technology,” said Traci Blido, economic development director for Bedford County. “The salaries in these industries tend to be higher and the employees are also higher skilled by being there.” In turn, these skilled workers tend to attract more industry to the region, she said. For ACS, the fact that people and industries are increasingly getting goods shipped directly to them, whether from a giant online retailer like Amazon or from their local grocery store, means business is growing every year. 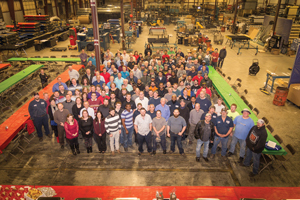 ACS is the largest U.S. manufacturer of conveyor equipment used in the corrugated and folding carton industry, according to President and CEO Michael Shenigo, and business couldn’t be better. Consider that 50 percent of what ACS sells today, they didn’t even make 15 years ago. While it’s generally not recommended to put all your eggs in one basket, or box, Shenigo says that is what ACS does so well. He credits his employees and the relationships they have cultivated with that success. “We have sold our equipment to the same customer base for 43 years,” he said. The formula is working. Since 2008, ACS has increased sales every year. The reason, he said, is they are always working to improve the systems to be faster and more efficient. For example, a small box commonly used by Amazon can be turned out at the rate of 800 a minute, up from 200 a minute not so long ago. People can’t handle boxes at that rate, but mechanized conveyor systems can. ACS makes everything needed in the process from conveyors and fork truck stations to pallet delivery systems and transfer cars. “We have the best mechanical, electrical, and computer system research and development departments in our industry,” Shenigo said. ACS not only designs and manufactures equipment, but it also installs it. The company has customers in all 50 states and in North and South America. The largest plant they are working with is now under construction in Sao Paulo, Brazil. ACS is building the conveyor systems for that plant in sections that will fit into container boxes sent by rail and ship. ACS started on Kemper Street in 1975 when Jim Taylor and George Ramsey created a spinoff from McVeigh Engineering. ACS moved to Millrace Drive off Graves Mill Road in 1996 and keeps growing to meet the demand for corrugated container systems. In 1996, ACS had 125,000 square feet of manufacturing space with another 25,000 square feet of office space. Four years ago, the company added 40,000 square feet and now wants to add another 42,000. One of those clusters was Metals and Machinery Manufacturing, Conveyor Systems, and Moving Equipment. “Through our data analysis, we found that Lynchburg has more than 870 people working in this sector in the city, an employment rate of 17 times the U.S. average,” Bentson said. Focusing on industry clusters has several advantages. “Due to their shared resources and markets, businesses in the same industry cluster can collaborate to solve issues within their own industry or throughout the broader community, including infrastructure needs and regulations such as incentives or zoning,” Bentson said. According to the Blueprint, about 2,100 Lynchburg workers have the foundational manufacturing and production skills needed to participate in this manufacturing cluster. Lynchburg’s manufacturing skill base is 42 percent larger than the U.S. average and is expected to maintain steady employment. The Blueprint further states that, on average, workers with manufacturing skills earn $39,500 annually. Education levels required for this cluster include a high school diploma and technical training. Shenigo says his 264 employees have found ACS a great place to work and are heavily invested in the company’s success. In fact, more than 30 people are now part-owners of ACS. For the last 25 years, employees have received a service bonus of a day’s pay for every year of service. Four out of the last five years, they have received that bonus twice a year. “We’ve got a great workforce,” Shenigo said. “We’re a very fortunate company because of our employees.” Employees work long hours during one of two 10-hour shifts on weekdays. The plant also runs for six hours on Saturdays and another four to five hours on Sunday. “Our people take a lot of pride in doing it right,” he said.